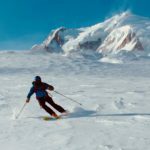 Our guided ski days bring together like minded skiers to form a team, share the cost of a guide and enjoy some inspiring guided backcountry ski journeys and high quality training in and around the Mont Blanc Massif. As with all our ski courses, we recommend you prepare as much as possible in advance with relevant ski fit preparation and then arrive at least a day or two early to both warm up your ski legs & check equipment. This is especially important if you will be renting boots or skis & bindings. Please also make sure your skis are well serviced & bindings correctly adjusted. 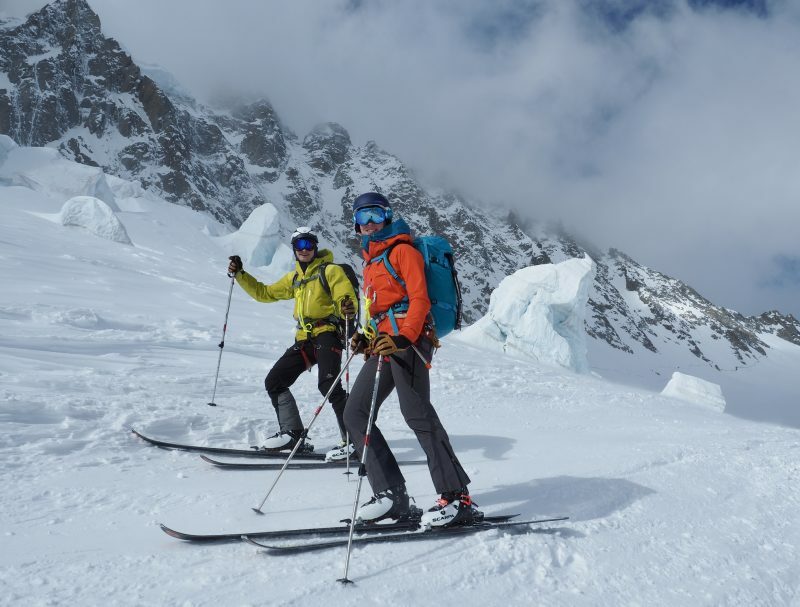 In addition to our 2 and 5 day Chamonix based ski touring courses, we also have a number of guided ski touring days which allow like minded skiers to come together to form a team and share the cost of a guide. 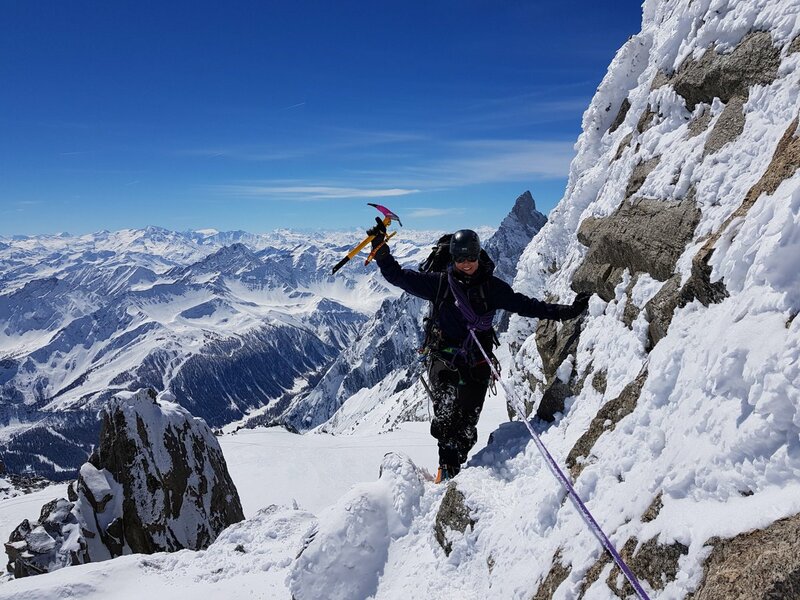 These run from January to April and offer the chance to sample the brilliant touring around the Mont Blanc Massif and the wonderful variety of terrain and snow to be enjoyed through the winter and spring seasons. 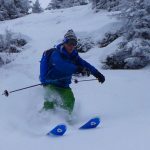 These open group guided days offer an enjoyable progression from our intro courses and aim to complete some fine longer tours with more ascent / descent and more sustained skiing. 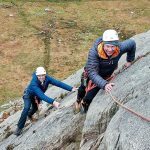 The aims are to have a great days touring, find good snow & fresh tracks and generally make the most of prevailing conditions whilst having an enjoyable & sociable day in the winter mountains. With a maximum group size of 4 guests to each guide, a venue can be chosen with a flexible approach to finding the best snow conditions for the day. 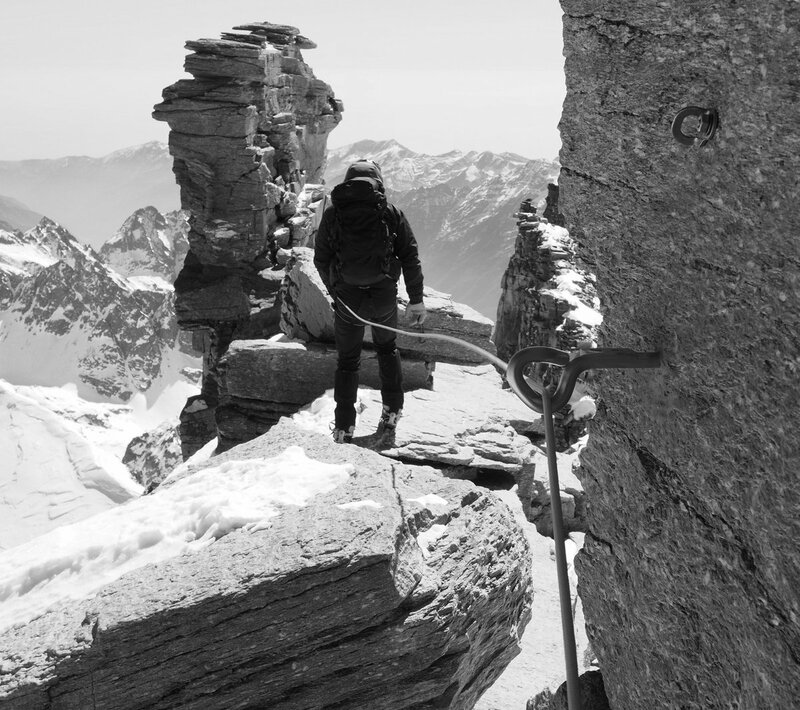 The chosen venue could be in the Chamonix Valley, nearby Italian Val d’Aosta, Aravis or Les Contamines depending on the snow, weather and avalanche forecast and we generally only make a final decision the day before. 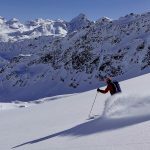 Favourite tours completed on these kind of days include routes like Croisse Baulet in the Aravis, Col de Cicle / Rochers des Enclaves in the Contamines Valley, Col de Tour Noir above the Argentiere Glacier or ski touring in the beautiful Val Feret on the Italian side of Mont Blanc. 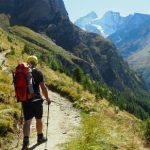 None of these are technically difficult tours but they are great journeys in beautiful backcountry areas. 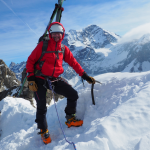 Depending on conditions there are a fantastic range of options including using the lifts of various resorts to get a head start on the ascent! 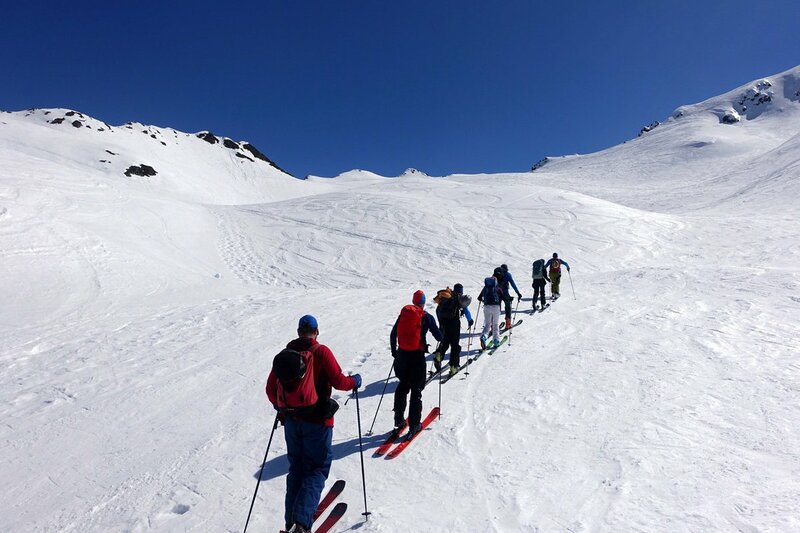 Guests on these guided touring days should have competent & confident off piste skiing skills, some existing ski touring experience and a good level of mountain fitness and be happy to skin for at least 800-1200m at a rate of at least 300m per hour. Or a bit less if there are heavy snow conditions, in which case we may use a mixture of lift and skinning uplift! 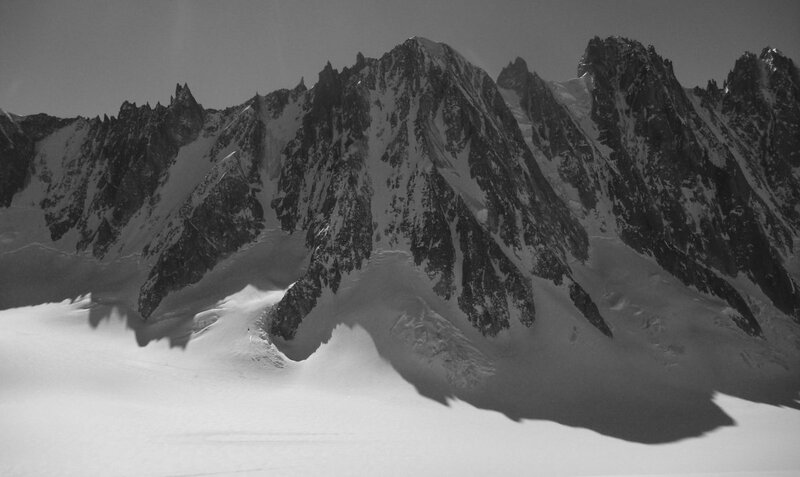 Ski touring above the Argentiere Glacier en route to the Col du Tour Noire. Classic Chamonix day tour. 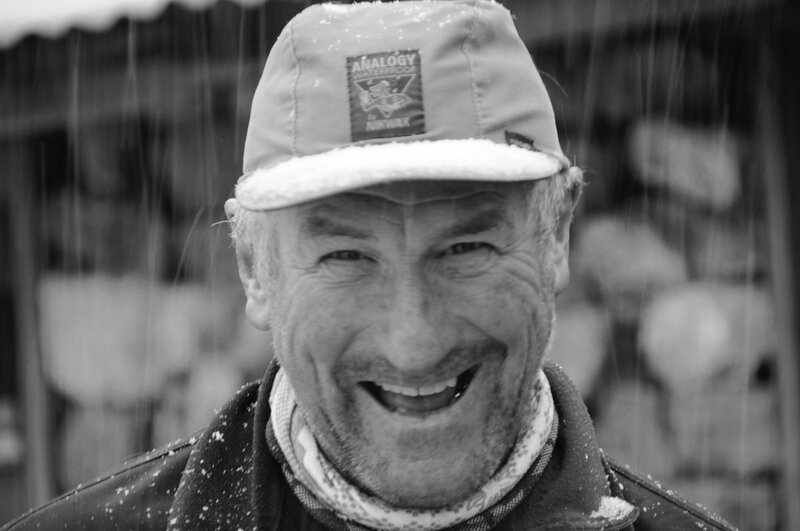 Some ski touring experience. You should understand how your touring bindings work, be able to put your skins on and skin effectively including reliable kick turns. At least a couple of previous days ski touring experience is required. 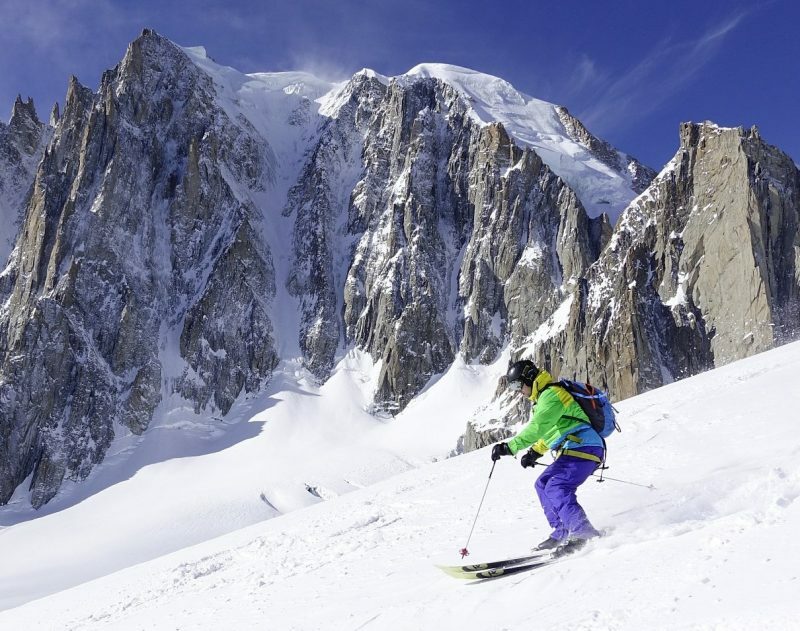 The Vallée Blanche is the most famous off-piste ski run in the world! 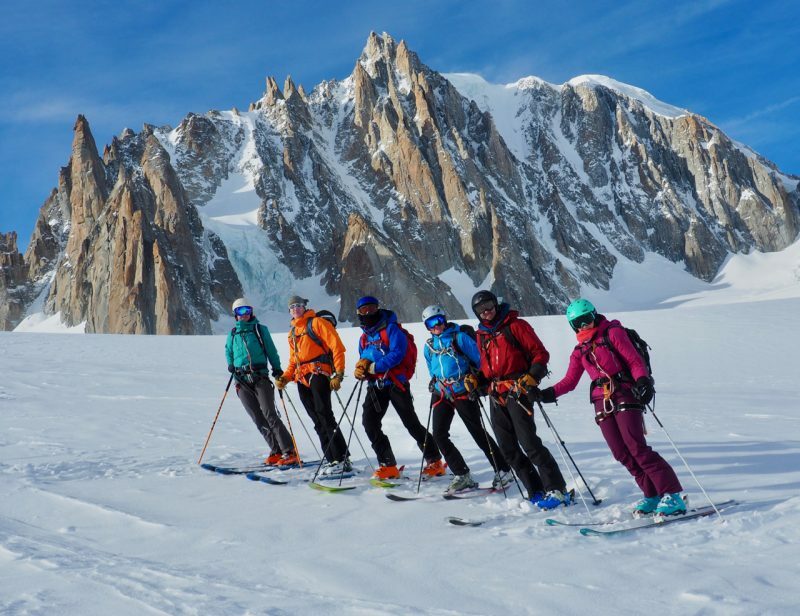 Thus it’s a very popular objective and as well as our private guiding services for skiing the Vallée Blanche we also bring together like minded skiers to form a team for the descent and share the cost of an IFMGA mountain guide. 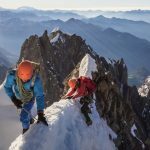 Thanks to the huge height gain (2742m) given by the Aiguille du Midi cable car, this magnificent ski journey can be undertaken in a short day by skiers of suitable ability. 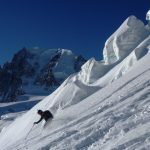 A descent of the Vallee Blanche is often the highlight of a ski trip to Chamonix and will provide a truly memorable experience and some great photos. 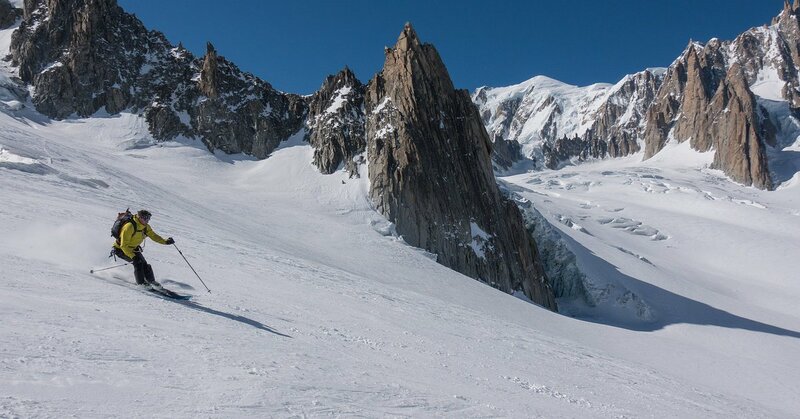 Sunny glacier skiing beneath the East Face of Mont Blanc du Tacul – In The Vallée Blanche – High above the Chamonix Valley. 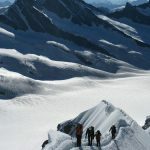 Good weather is required to make the descent of the Vallee Blanche due to the crevassed glacial & high mountain terrain. 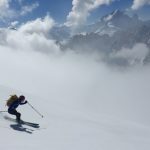 In the event of the weather or snow conditions not being good enough for a Vallee Blanche descent on the day we will provide a good suitable off piste alternative in the area. 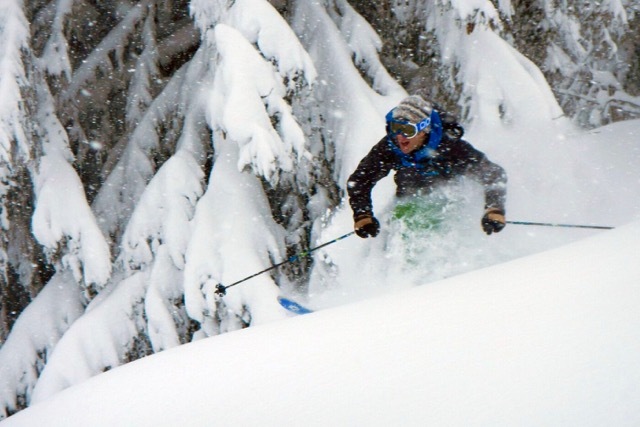 Often poor winter weather means powder so there is some good alternative skiing to do with fresh tracks in the trees! To join one of these days you must have the required off-piste ski ability & fitness. 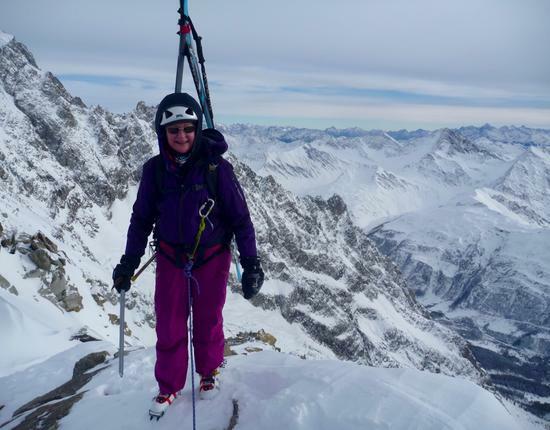 Please make sure you have read our Ski Vallee Blanche page details and FAQs and can confirm you are capable of skiing the descent in good style. 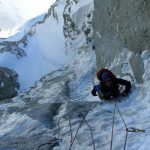 If you are not sure about this we can arrange a Vallee Blanche training / off piste preparation day in advance but you must not commit to the descent unless you are confident in your ability to complete it safely and effectively. Solid off piste skiing ability & experience. Able to ski a variety of snow conditions on off piste slopes up to the equivalent of a black run. This need not be with speed or great style but should be in control with the ability to ski short radius turns and steer very accurately, eg around crevasses or other hazards. An ability to ski lots of big bumps which can arise during busy periods without fresh snow. A decent level of fitness is required in order to complete this long & sustained high altitude descent in safety and style. 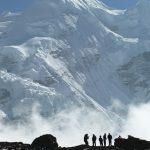 The demands of starting the descent at nearly 4000m are significant! This is a guiding fee only & does not include any equipment hire, lift pass, food & drink, insurance or any other expenses. Maximum guiding ratio of 6 guests to 1 Guide. 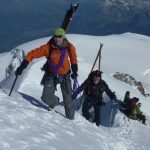 Our Ski Haute Route training days are an excellent opportunity to brush up on the more technical elements of ski touring and ski mountaineering. 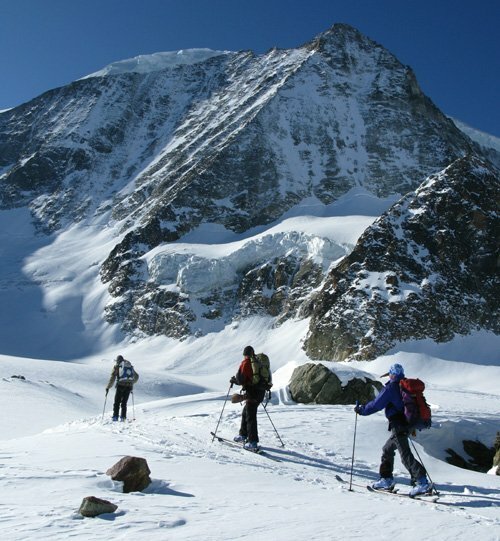 As part of an enjoyable day off piste skiing and completing some mini training tours, the group will visit a variety of different types of terrain similar to what will be encountered on the Chamonix to Zermatt high level ski route. Efficient transitions & looking after yourself on tour! Lunch / cafe breaks with general tips and Ski Haute Route Q & A! The aim of this training & refresher day is to cover these skills as part of an enjoyable days skiing and touring. This is generally done as part of a lift accessed off piste day with micro tours away from the resort rather than aiming to do a larger tour as there is not time for that and all the training! 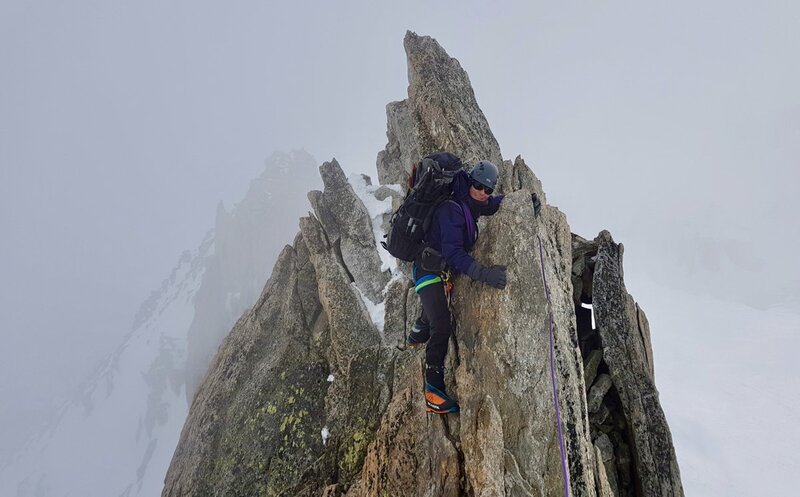 This day serves as both a warm up day for those about to start the Haute Route and extra advance training for those planning to do it in future, or just interested in gaining the skills. It is usually based at one of the resorts in the Chamonix Valley, generally the Grands Montets ski area. 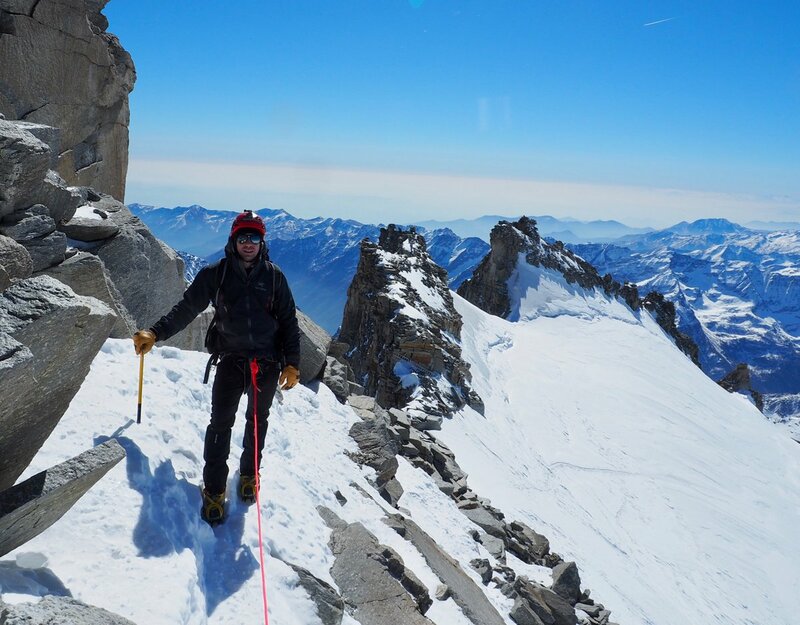 Our Verbier to Zermatt Ski Haute Route course starts the following day. 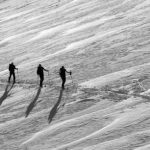 Some ski touring experience. You should understand how your touring bindings work, be able to put your skins on and skin effectively including kick turns. At least 3 previous days ski touring experience is required. A good level of fitness is required in order to complete a sustained day of training and skiing. The aim is not to do a big / long tour but you should be able to ski up hill for at least a couple of hours doing around 300m+ an hour as a minimum. 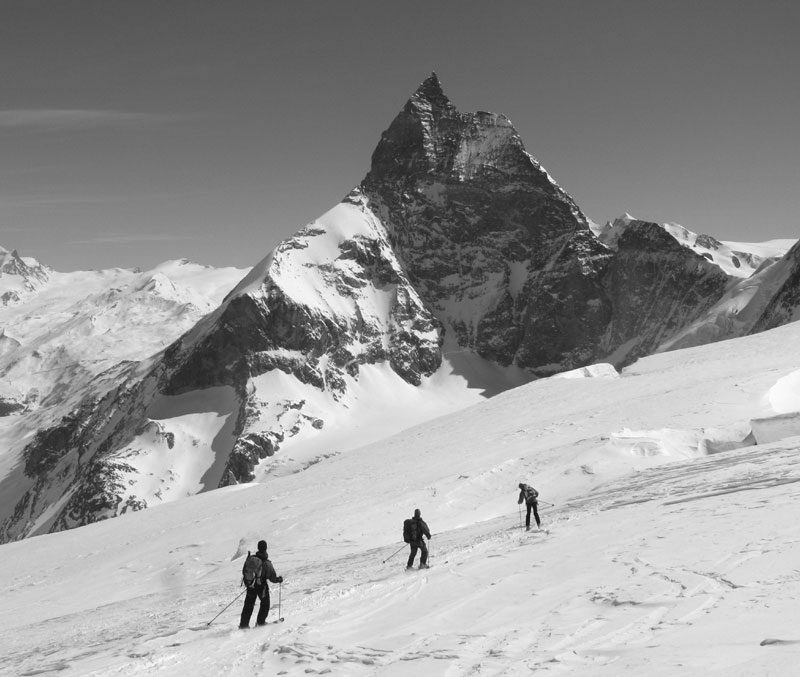 The magnificent last day of the Haute Route, skiing the Stockli Glacier in to Zermatt and beneath the Matterhorn. What a finalé….and worth training for! 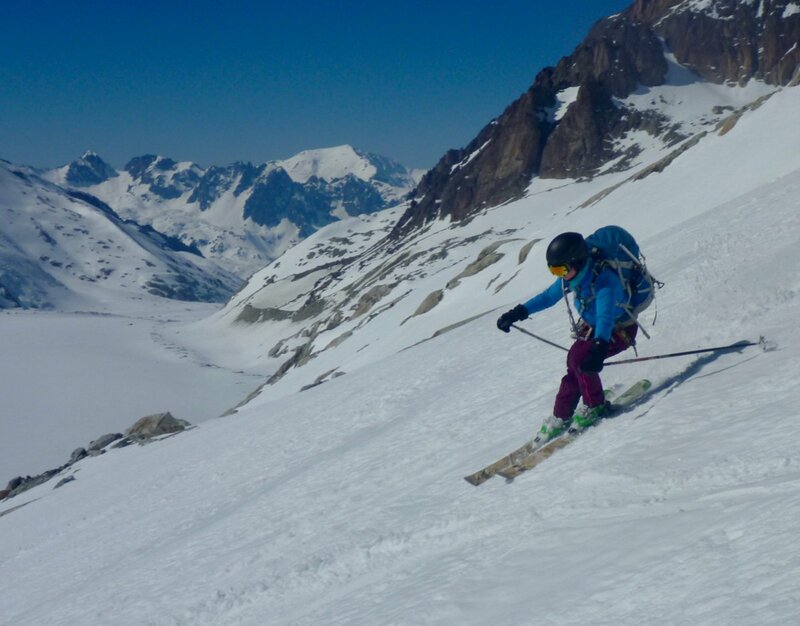 If you have already experienced some off piste skiing, and got a taste for more, then this is a great opportunity to go further into the backcountry under the guidance of an IFMGA Mountain & Ski Guide. These days are all about great skiing, fresh tracks (if possible! ), with some mountain training including avalanche awareness, meeting other like minded skiers & having a great ski day out in the Chamonix Valley. 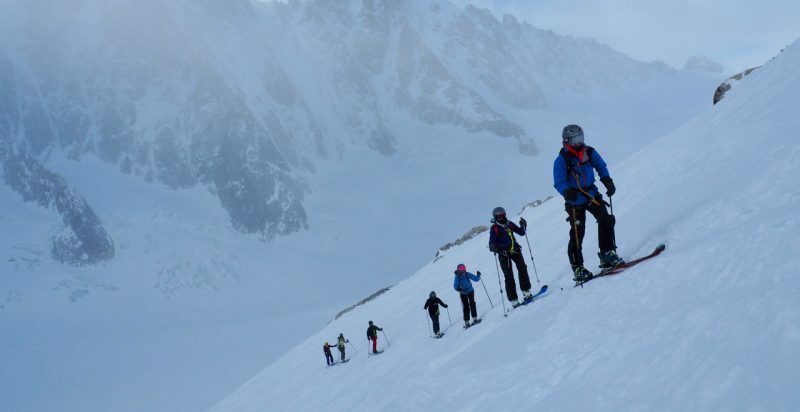 Whilst some off piste safety training is given, these guided days are not ski coaching sessions and for this a good qualified ski instructor should be hired. We recommend contacting Alison at off piste performance. Alison demonstrating great off piste technique high on the Grands Montets Glacier above the Argentiere Glacier, Chamonix. 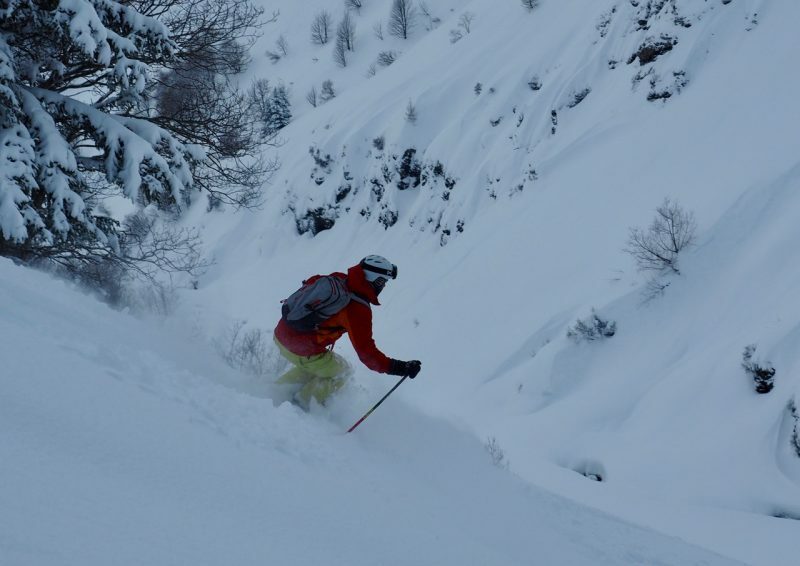 Which of the many excellent off piste venues in Chamonix we choose to ski is decided by the Guide the evening before and is based upon the prevailing snow conditions, latest weather & snow / avalanche forecast. We will contact you the evening before to arrange a time & place to meet. 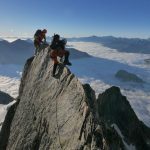 It will usually be an 0830 meet at a cafe at one of the great resorts in the Chamonix Valley like the Grands Montets, Le Tour, Brevent / Flegere, Les Houches or even across on the Italian side of the Mont Blanc Massif at Courmayeur. 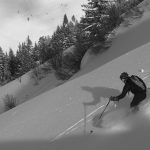 If conditions are very snowy, with great powder but poor weather & a high avalanche risk we often also ski a little further down the Arve Valley at the brilliant lower resorts like St. Gervais, Megeve or Combloux. After an introduction we have a short discussion on the snow conditions and address 2 important questions: Firstly where do we NOT want to ski today and secondly where DO we want to ski today?! 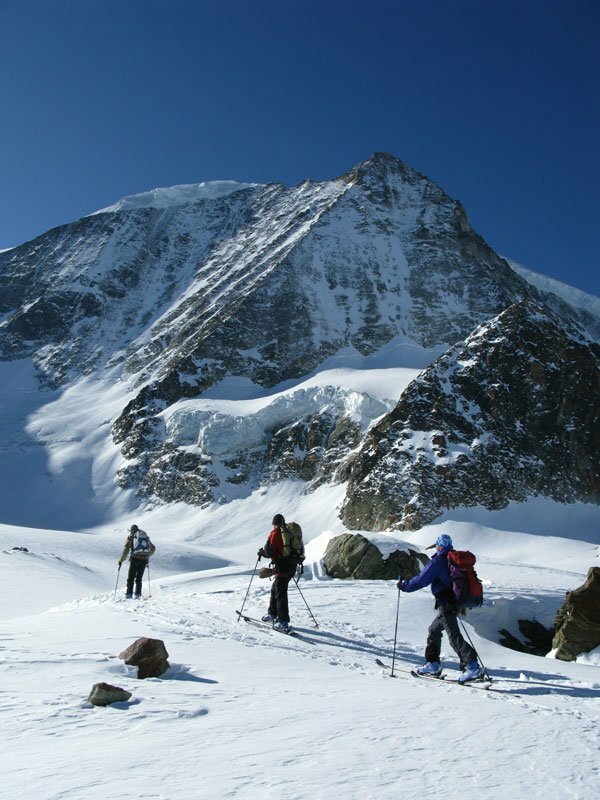 We will then ski for the morning using lifts or with short walks (max half an hour) to access great off piste terrain. We will usually have lunch in a cafe before venturing back out for an afternoon of more skiing & training. The emphasis will be on accessing interesting terrain & making off piste journeys rather than skiing anything steep or ‘extreme’. Superb powder snow even down to car park level (1463m) at Le Tour in early winter 2018. 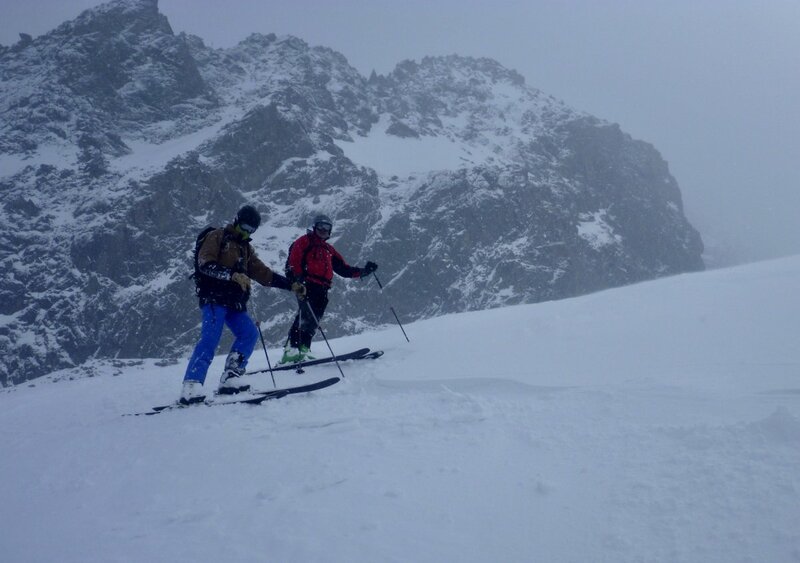 John, Jean & Tom, Chamonix Off Piste Private Guiding, Winter 2015, 16, 17 & 18! Thanks for a great day of off piste ski-ing – Great fun and a massive improvement in our abilities & awareness off piste; no more piste-bashing for us! 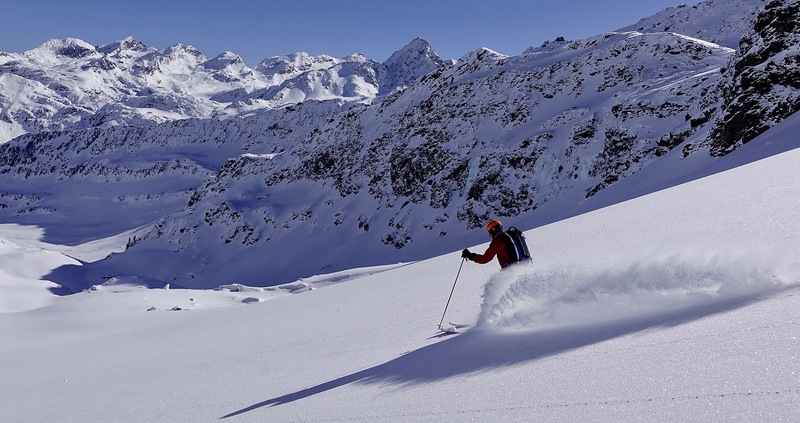 To get the most out of these guided days you will be an intermediate off piste skier. If you are a complete beginner please first take some good quality off piste ski coaching. 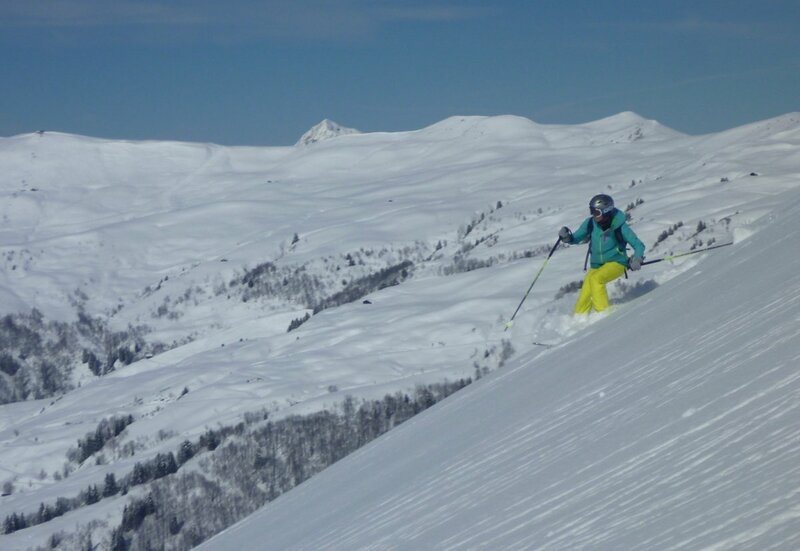 You will be able to ski pisted black runs with linked parallel turns in good control and also have some off piste or ‘side country’ experience in varied snow on non groomed terrain. You do not have to be an expert and good fitness and enthusiasm to try will go a long way! There will be nil or very limited uphill during the day – at most just a bit of walking carrying your skis. However a decent level of ski fitness is still required for the long vertical descents in variable snow conditions that are a feature of skiing in the Chamonix Valley! If you are unsure of your ski / fitness levels and want to check before booking then please send an email detailing your relevant experience via our contact form at the base of the page. 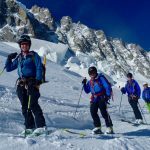 This Chamonix Guided Ski day would also work well as a warm up day for a Ski Vallee Blanche day and give you a chance to discuss with the Guide whether or not you have the ski ability required to safely enjoy the Vallee Blanche descent. Please refer to our Off Piste Equipment List for full details of the gear required. In summary this includes ski clothing suitable for both very cold & windy & warm and sunny & specific off piste equipment including avalanche transceiver, shovel & probe. 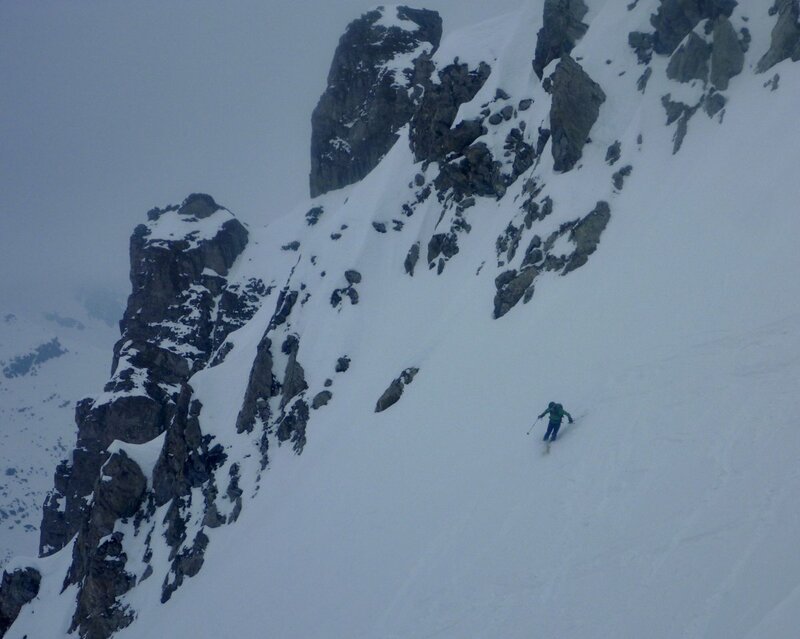 Enjoying the fresh tracks in deep soft snow on a storm day in Chamonix.